What a surprise to drive into one of Los Angeles’ older neighborhoods to come upon this most original and exuberant expression of Streamline Moderne architecture in the midst of more mundane brick and mortar! If you aren’t expecting it, this structure just makes you stop and stare! What is it? An ocean-going steamship with enormous concrete Coca Cola bottles? A bit of Hollywood razzle-dazzle? Maybe a leftover prop from a 1930’s Busby Berkeley film? 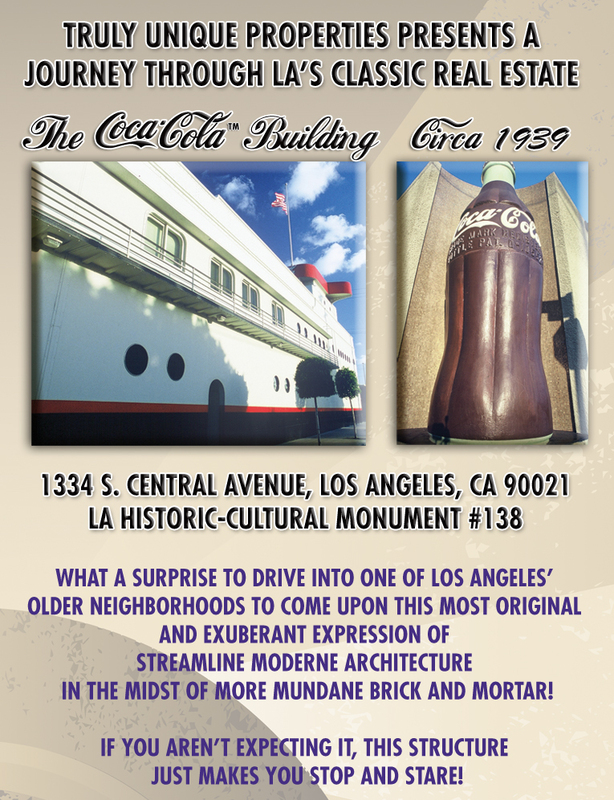 The Coca Cola™ Bottling Company’s iconic LA building was designed by architect Robert V. Derrah to tie together several existing buildings. Mr. Derrah was a devotee of the Streamline Moderne’s Age and its exultation of speed, freedom and mobility. To celebrate the time, Mr. Derrah used the great steamliners of the day as his inspiration, designing a unique structure with porthole windows; bulkhead doors; hatches; rivets; a catwalk; a promenade deck; and a bridge. All design elements enhancing the long flowing lines and shape of an elegant sea-going ship–an ambitious and successful blend of art and commerce–that still enchants us today.